The merry pranksters at Fools Paradise are gearing up for a great spring with their April Fools collection of new releases set to debut at STS with online pre-orders set for April 12th. So far, Fools Paradise has revealed Dokan Awaken// Pink and their officially-licensed Popeye figure. 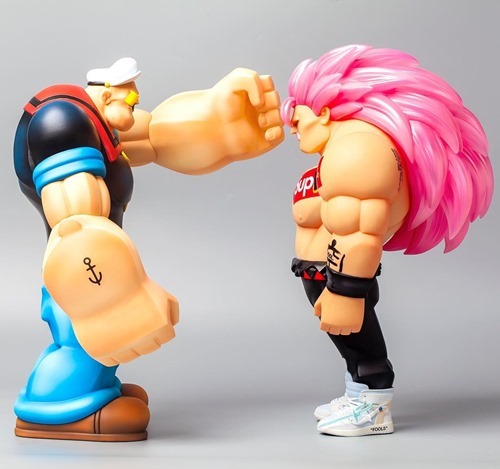 Seemingly out of nowhere, FP's take on Popeye blends the Low Fool-style treatment with the classic character. The first 100 pieces of each figure will be available at Fools Paradise's STS booth. Amanda Visell introduces us to a very clever Giraffe. Quickly acclimating to it's environment, the Big City Giraffe struts its chameleon-like skills. The charming resin set features the Giraffe and look-alike house. 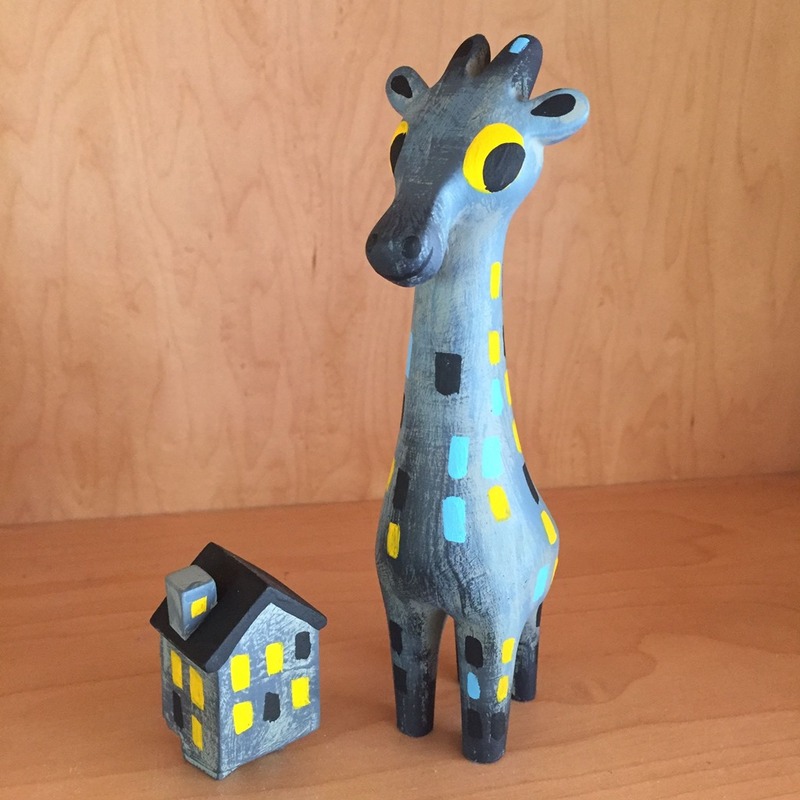 Limited to 15 sets, Big City Giraffe is available now for pre-orderfrom Switcheroo for $90 and should ship out in 2-3 weeks. For the Shanghai Toy Show (4.12 - 4.14), J.T Studio revisits its street-wise Yoru character from the Street Mask Series. The STS Exclusive 8" Yoru Fluorescent GID vinyl reveals the the darker half of the yoyo player's story. As the sun drops, Yoru opts for his money gun over his trusty yoyo, his attention turning from competition to partying. His GID fox mask pays homage to Inari, the Shinto god of the Kitsune. 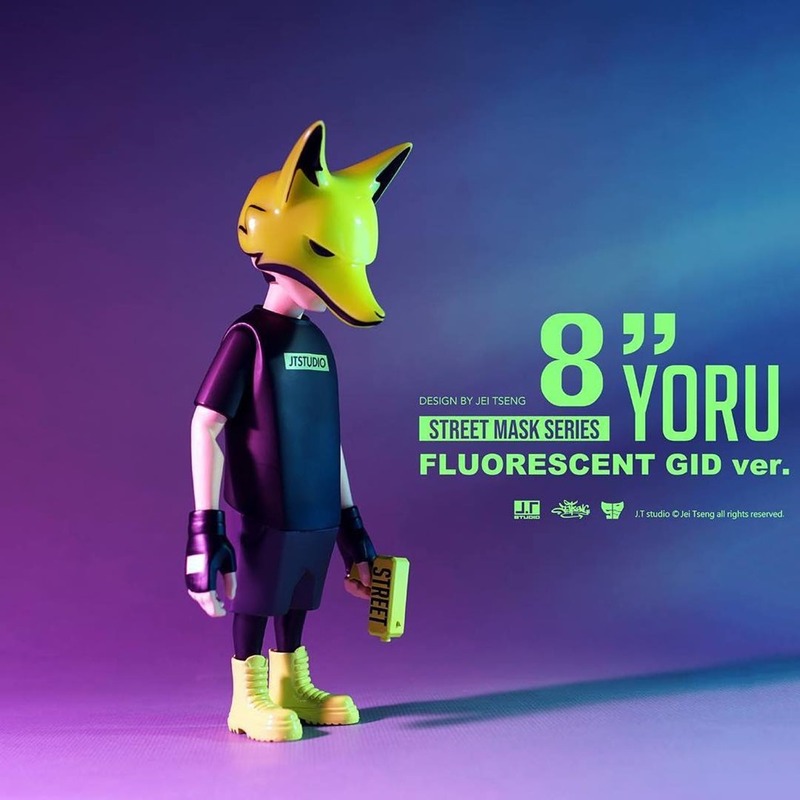 The STS Exclusive 8" Yoru Fluorescent GID vinyl is limited to 100 pieces and will be available for 790 RMB ($118) from the J.T Studio booth [A29]. 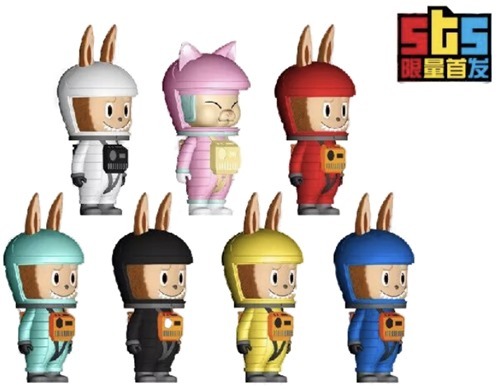 Kasing Lung will release his new Labubu Astronaut blindbox series at Shanghai Toy Show (4.12 - 4.14) from his booth [A63] for 599 RMB ($89), presumably for a set of six. The super cute cosmic series combines his signature Labubu character with his very popular Astronaut figures into what's likely to be an irresistible package. Shown above, the series feature six standard figures and a special pink chase featuring Shon's astro kitty from his A Space Dream figures. Surprise. Coarse continues its stealthy ways with the sudden release of Strangers — Ignited without any pre-release hype or fanfare. The Ignited version of the stylishly enigmatic Ethos series piece features a GID Void sitting atop a interwoven, jumbled mass of bodies—some young, some old, strangers separated by the vagaries of time and circumstance. For this Ignited release, only the Void receives the GID treatment—the ball of people below features a paint application similar to the Paranoia edition, albeit with different colored trunks. Limited to 199 pieces, Strangers — Ignited is available for $199.99 (plus s/h) from the Coarse Shop and will ship out within 1-2 weeks. With the previous release of the 3rd Cells edition and now the 3rdd Strangers edition, Coarse has marked a path for the announcement of the 3rd Ethos figure due later this year. As previously mentioned, 2petalrose's Kid Katana figure is making the jump to production resin figure by way of Collect and Display and Unbox Industries. Today's update brings a full reveal of the Original Renegade edition and confirmation that the first 12 pieces will indeed be released from Collect and Display's ToyCon UK booth (3.30 - 3.31). With helmet, Original Renegade stands at 8" taller, considerably larger than the original 3.5" release and an inch or so taller than the artist customs created for his Crouching Shogun, Hidden Ninja show held in January at Wootbear. 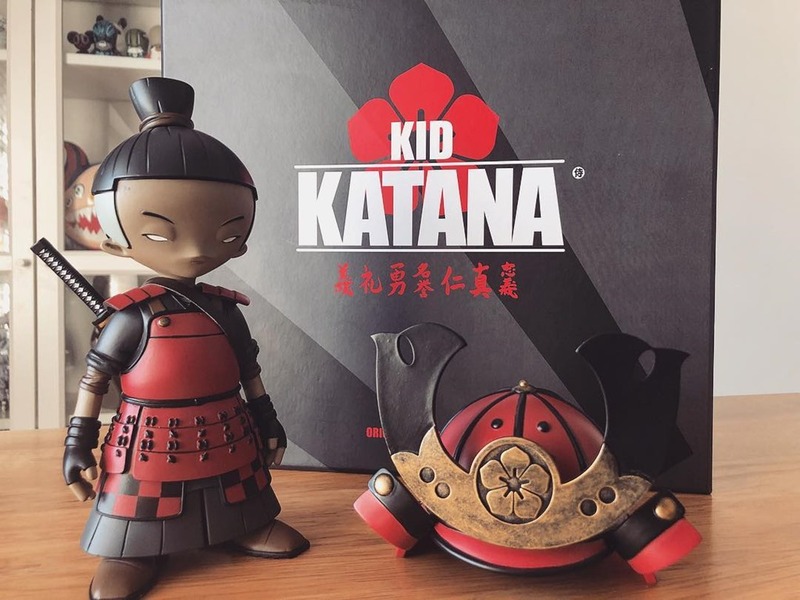 As seen in the photo and Collect and Display's unboxing video, the new Kid Katana is quite impressive, comes with ornate samurai helmet and katana—with leather strap and ribbon battle wrap— and will arrive in a handsome box complete with shaped-foam insert. 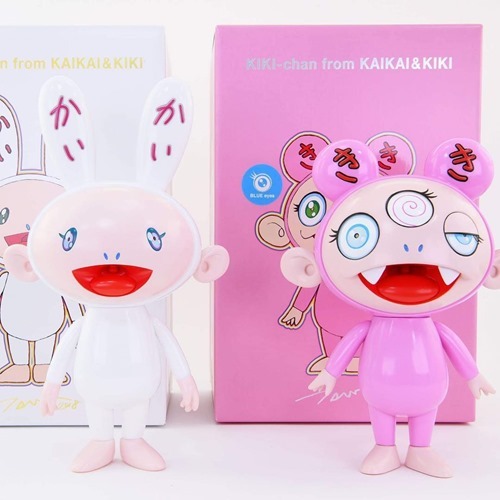 Instinctoy's next lottery may be just the thing for Takashi Murakami collectors who missed out on the OG Kaikai and Kiki soft vinyl set which debuted at ComplexCon. As work continues on their anticipated Mr. DOB collaboration with Murakami, Instinctoy is offering an exclusive Kaikai & Kiki set featuring blue eyes rather than the green eyes of the OG set. Featuring the blue-eyed Kaikai (9.4") and Kiki (7.9") sofubi figures in individual boxes, the exclusive set is available via lottery until 7:59 AM PDT on Sunday (3.31) for ¥81,000 (~$727). Entering is simple via the Instinctoy online stores: International or Japan. 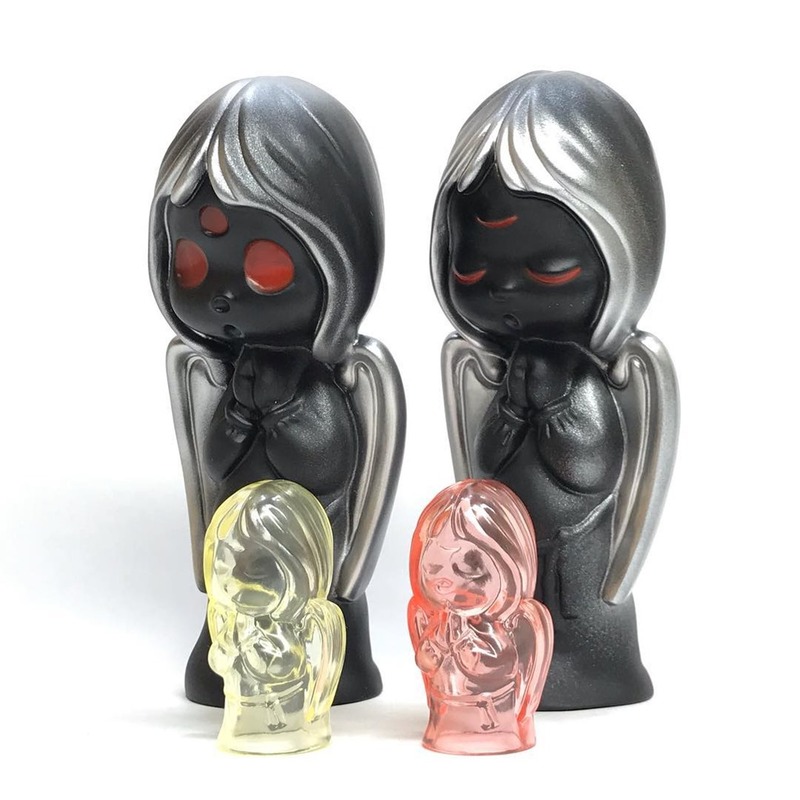 Kurobokan debuted the new Black and Gold editions of their Daydream and Kinohel (Nimbus) vinyl toys at their recent Scratching the Surface exhibition with Paradise Toys in Taipei. For those that couldn't make it out to the show, Kurobokan will release both the Daydream (Nimbus) - Black and Gold ($40) and the Kinohel x Nimbus - Black and Gold ($50, $100 pieces)—a collaboration with p.p.pudding—on Friday, March 29th at 9PM PDT from their online store. From Nimbus's focused, determined expression to Kinhohel's charming appearance in her black + gold outfit complete with Daydream Nimbus hat, the new releases continue Kurobokan's tradition of light-hearted, adorable art toys. 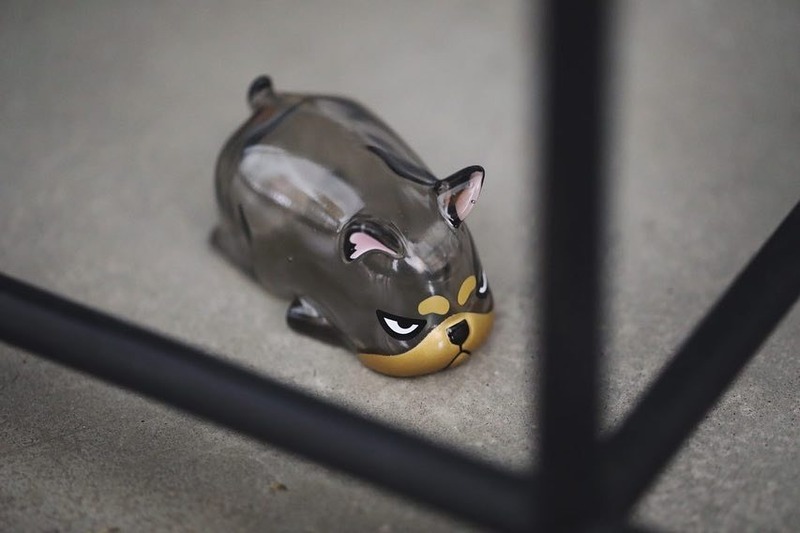 Kidrobot continues its recent string of Friday exclusives with a curiously clever collaboration with Locknesters. Known for their series of interlocking 3D sculptures—part puzzles and part design objects—Locknesters has used their signature approach to create an 8" Dunny like no other. The individual, interlocking pieces feature striated textures in neutral gray tones. Displayed in pieces, partially assembled or fully put together, the KR x Locknesters collaboration offers a unique Dunny experience highlighting and playing with the iconic form. 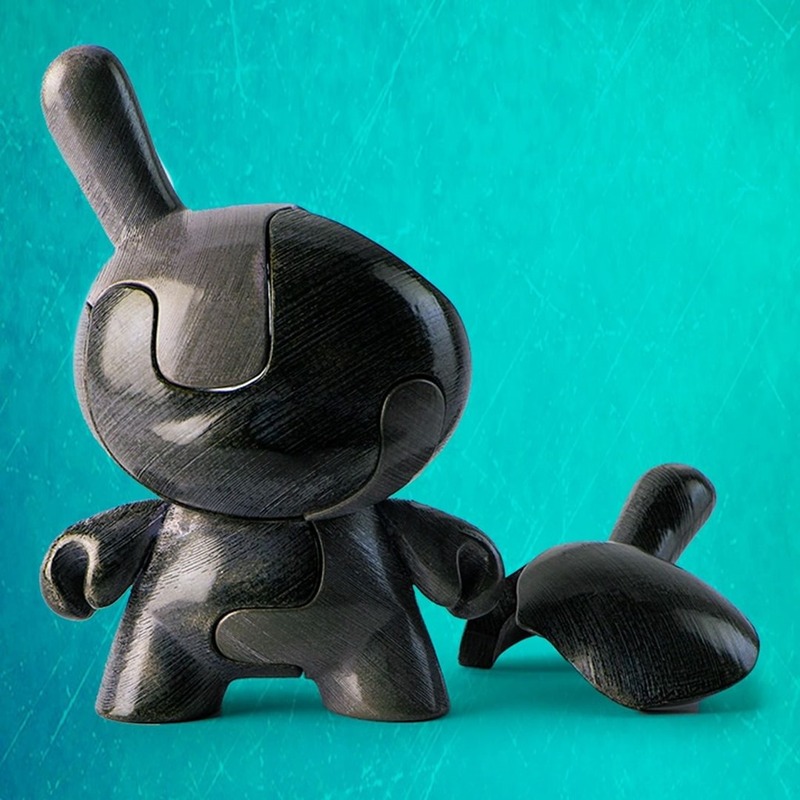 The first of a series of planned collaborations, the Locknester 8" Puzzle Dunny No. 1 is limited to 250 pieces, comes in a fun Dunny-shaped, vacuformed package and will be available on Friday (3.22) at 9 AM PDT for $100 exclusively from Kidrobot.com. 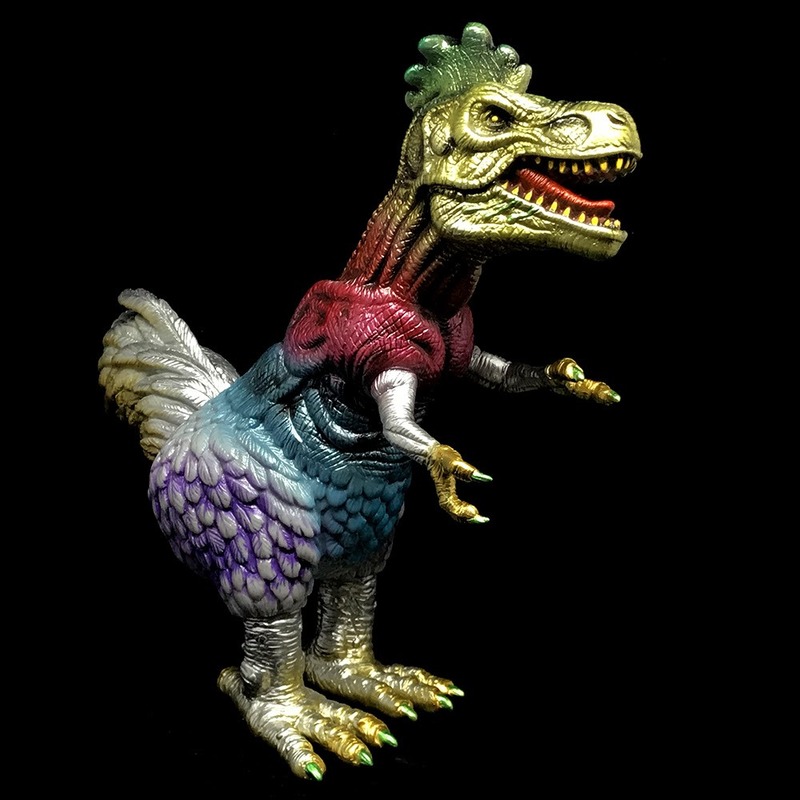 The terrifying, prehistoric conundrum that is Poultry Rex has returned. The new factory-painted Spectral Terror edition from Ron English and Toy Art Gallery features a ravaging rainbow design starting with a 'natural' olive green for the head and quickly turning into a riot of vivid hues with metallic gold and silver accents. The 8" Poultry Rex Spectral Terror soft vinyl toy features five points of articulation (Arms, tail and feet) and is available now directly from the TAG web shop for $95. Reina Koyano will release six Sole Fatale giclee prints (13x19") via 3Dretro—the exclusive retailer for her prints—today (Tuesday, 3.20) at 1 PM PDT for $60 each. 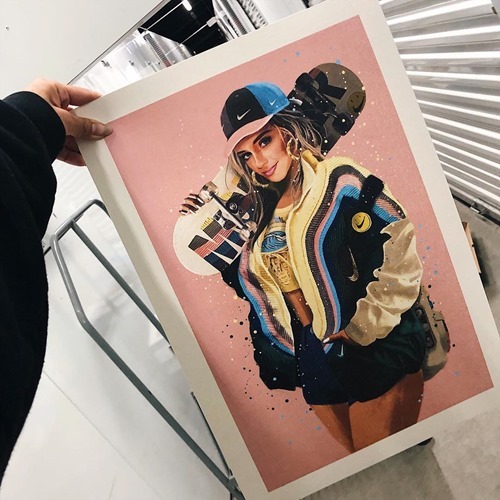 Featuring imaginative portraits of women dressed in outfits inspired by specific models of Nike sneakers, Koyano's Sole Fatale series continues to grow in popularity. This release features How Many Sneakers You Got? (AM90 We Love Nike), Sneakermail (AM1 We Love Nike), Queen of Siberia (AM! atmos Animal 2.0), Queen of the Jungle (AM95 atmos Animal 2.0), Have a Nike Day (AM97/1 Sean Wotherspoon), and Call the Plug (AM95 We Love Nike). 3DRetro will have a limited quantity of each of the unframed, open edition prints for this release. The T's have it. Tuesday brings a triple-threat from Tracy Tubera. Unruly Industries has announced and is taking pre-orders for the new Marvel-licensed Miles (5"), Wade (8.6") and T'Challa (9.9") art toys created by Tracy Tubera. Drawn from Spiderman, Deadpool and Black Panther, each of the figures features Tracy's sneaker-centric, urban aesthetic with dynamic poses and exaggerated proportions. Sneakers and superheroes come together with streetwise synergy in all three of Tracy Tubera's hyper-energetic interpretations. Each of the three figures is available for pre-order now from Sideshow Collectibles for $135 each. While the material is not specified, we believe these will be vinyl, perhaps with ABS accessories and components. 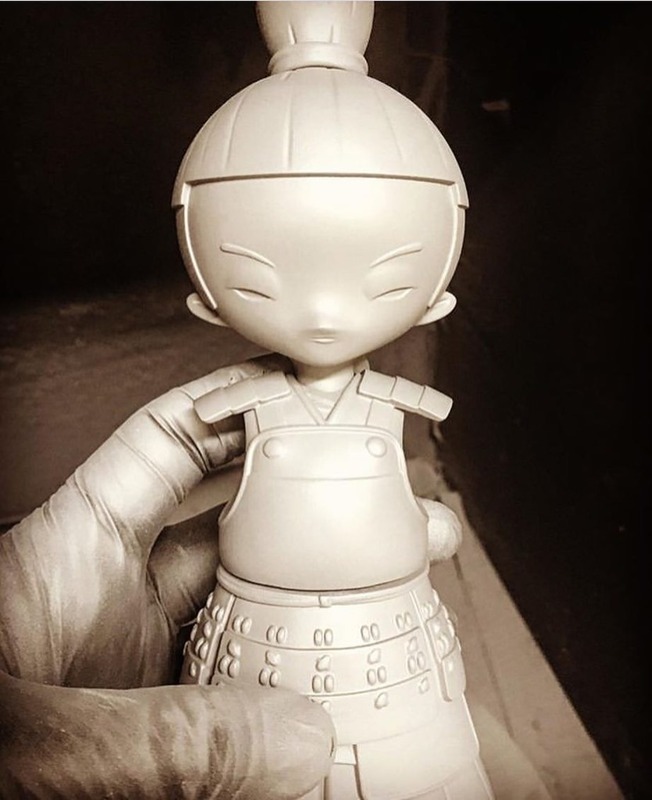 2petalrose has teased his upcoming 7" Kid Katana production resin figures in the works from Collect and Display. Twice the size of the original Kid Katana figures, the new figure will be a deluxe release with the details and flourishes one expects from a 2pr figure with the added benefit of larger run sizes. Sculpted by Oasim Karmieh and produced by the fine folks at Unbox Industries, the dream of a production 2pr toy will soon be a reality. No word on the debut drop, perhaps Toycon UK (3.30 - 3.31). Back in November, Toynami released a DesignerCon exclusive Mospeada print by Jerome Lu. Where there's an exclusive print, there must be toys? In this case, the answer is thankfully yes. 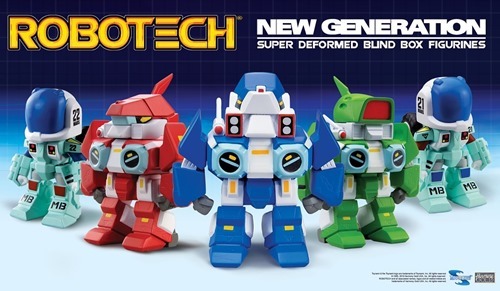 Toynami has just announced their brand-new Robotech New Generation mini figures featuring stylized, super deformed versions designed by none other than Jerome Lu. The blind-boxed series features the mechs you loved from the New Generation (Mospeada) cartoon including Alpha Fighter VFA-6H, Alpha Fighter VFA-6HI, Alpha Fighter VFA-6HZ, Scott Bernard Cyclone VR-052F, and Rand Cyclone VR-052T. Surprise! 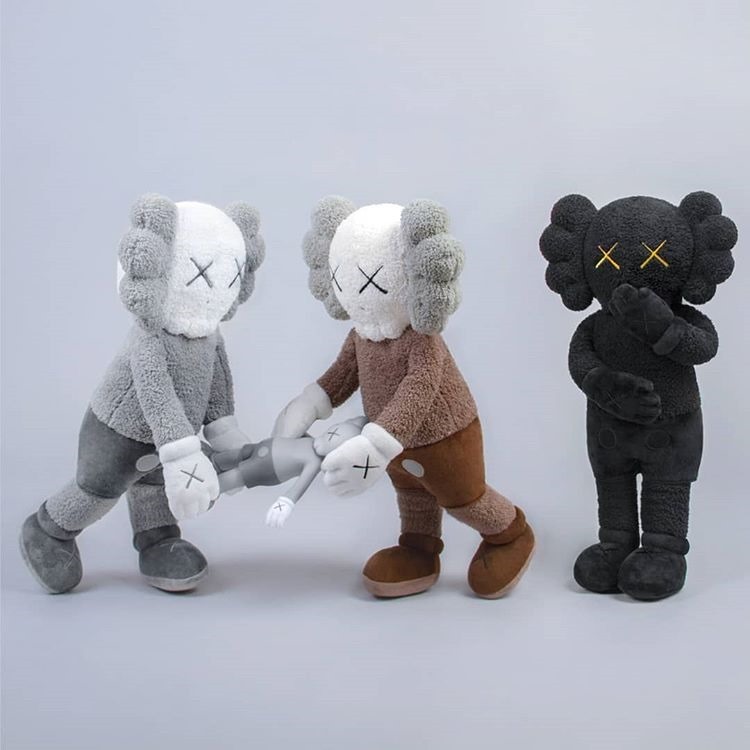 In addition to the previous announced KAWS: Holiday Hong Kong collection, KAWS and All Rights Reserved will release exclusive limited-edition 20" Companion Plush toys. Based on the photos these feature a soft, terry-cloth like texture and will be available in Gray, Brown, and Black as a set. Even more interesting is that they appear quite posable, perhaps through some sort of flexible armature? The KAWS 20" Companion Plush will drop on Thursday (3.21) at 6 PM PDT from DDT Store along with reset of the KAWS:Holiday Hong Kong collection. VTSS has released Roby Dwi Antono's Intimacy in two sculptural editions. Based on the Indonesian artist's drawing of the same name (see photo gallery), the Pop Surrealist piece features a girl with a rabbit head but apparently human hands and feet sharing a moment with an amorphous, cloud-like creature with distinctly human faces, perhaps an exploration of human nature and identity. First shown at One Art Taipei in January 2019, Intimacy is available for pre-order in a hand-painted polystone edition (Edition of 100, 13", $600) as a well as a white ceramic edition (Edition 50, 10 inches, $800) direct from VTSS. Both editions laser-etched wooden boxes. Each also includes special signed/number certificates of authenticity done in wood for the polystone edition and in ceramic for the ceramic edition. 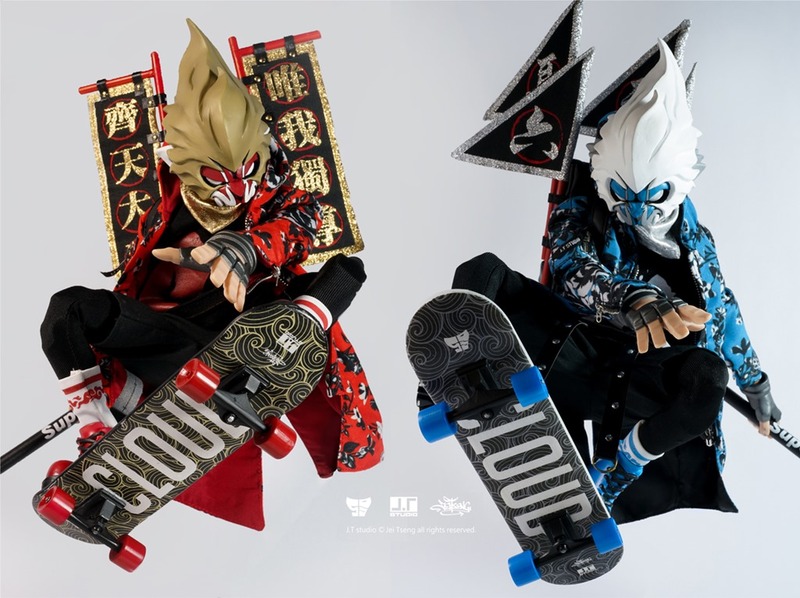 JT Studio has completed production on their Street meets East Kong and SIxx 1/6 figures. First available as a pre-order back in October '18, the figures blend East and West, Modern and Traditional by fusing the legend of the Monkey King (Sun WuKong) with skating and street style. Kong & Sixx are in-stock and available for purchase directly from the JT Studio shop for $280 (+ s/h). They are also available in a deluxe 2-pack set ($550) which includes bonus fiery masks. The fiery Kong and his alter-ego Sixx come with a diverse set of accessories and clothing including Wu Kong-style masks, battle flags/banners, 'Superbar' staves, floral all-over-print hooded jackets, three sets of interchangeable hands and of course 'cloud' decks, a fun reference to the the legendary Monkey King's use of clouds to move about. Kong and Sixx are the latest examples of JT Studio's skill and creativity in making 1/6 art figures, a category in which it has few peers. First shown in unpainted form at TTF 2018, the NanoTEQ: Nutbuster (6") vinyl sets from QUICCS and Devil Toys will be available for a 2-week pre-order starting this Wednesday (3.20) at 8 AM PDT directly from Devil Toys for $89.00 per set. 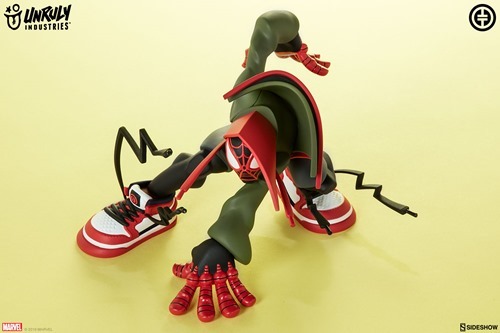 Select retailers including myplasticheart are also offering both editions during the 2-week pre-order period. The Nutbuster provides a full, mechanized power suit, amplifying the capabilities, reach, and destructive potential of the wee NanoTEQs. The NanoTEQ: Nutbuster will be available in two editions: OG Black as well as Ghost White. Veterans of heavy action, both versions have the wear and tear scars you might expect, with weathering/distress details throughout. As seen in the photos, the NanoTEQ can be easily removed from the Nutbuster for display/play. Previous NanoTEQ figures should be equally at home in the Nutbuster cockpit. Freakroom returns to the deep, dark depths of the ocean with a new edition of his Mythrilhorn of The Ocean sofubi, inspired by the actual Anglerfish populating our oceans. Emperor King features a shiny, metallic purple + gold design. While likely unintentional, it reminds us of a certain NBA team. Limited to 24 pieces, the Emperor King edition (7") is available for $155 via email lottery through 6 AM PDT on Monday (3.18). For full entry instructions, head over to the official announcement. Happy fishing. The wait is almost over. 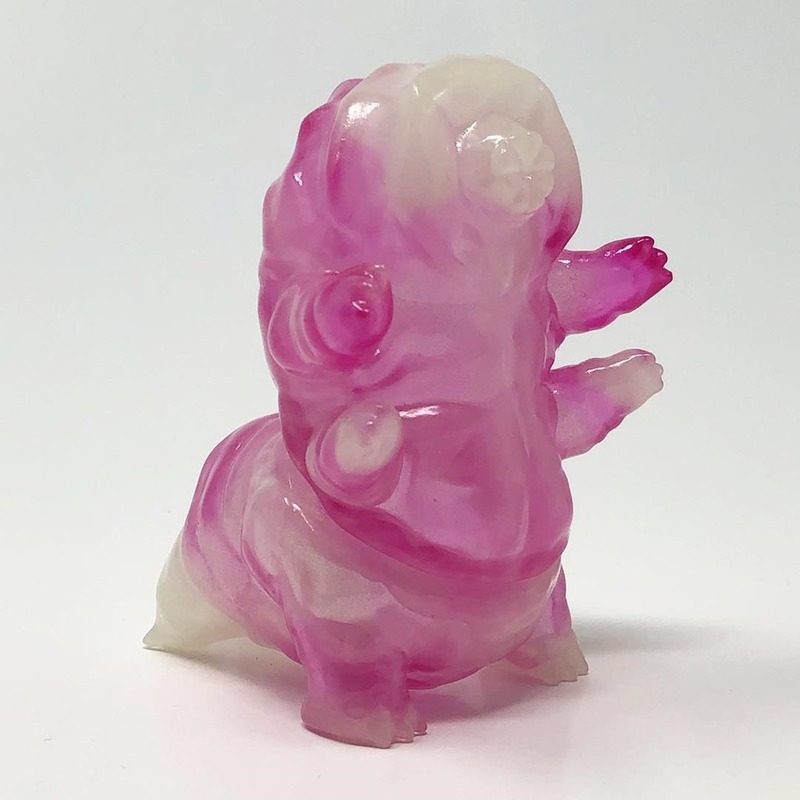 Woot Bear will release their exclusive Tarbus the Tardigrade on Saturday (3.16) at 12 PM PDT for $22 from their online store and their SF location. Produced by DoomCo Designs, this exclusive features a marbled pink + GID design equally suited for day and night or just lights off display. Limited to just 35 pieces, the 3.5" figure features articulation at the waist and has the distinction of being the first product to be designed completely in VR. 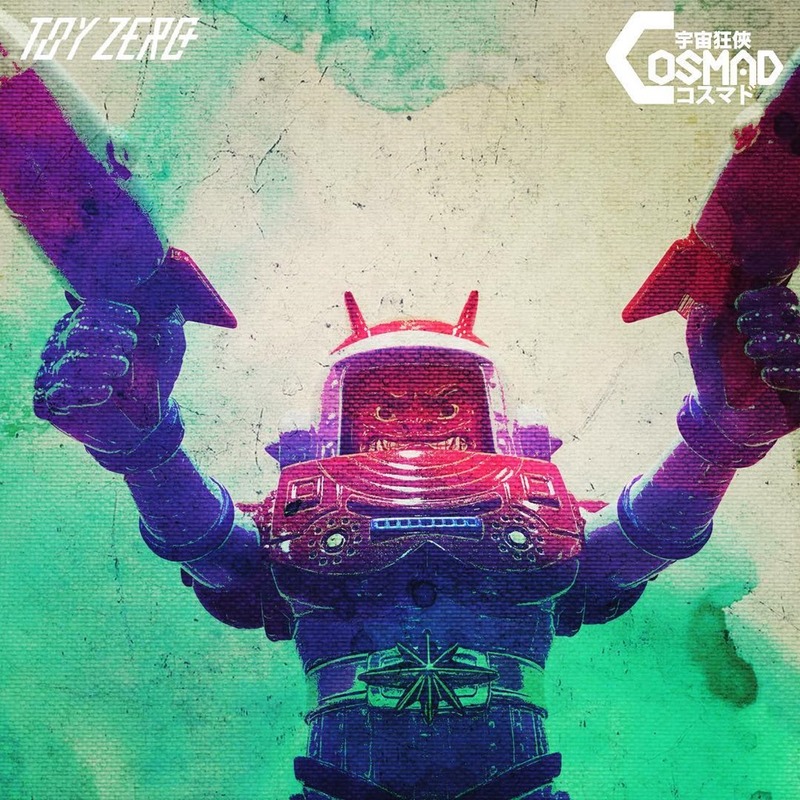 Cosmad, the multi-faced cosmic instrument of destruction from HK-designer Happiest Fung and ToyZeroPlus is almost ready for prime time. In fact, the designer has been running a countdown, currently at 3 days. Whether that's three days to release or full reveal is not clear. Thankfully the stylized teaser shots have revealed quite a bit of the dual-blaster wielding warrior including what appears to be at least three faces—skull, happy, and angry. The happy + angry faces are inspired by traditional red+black Asian folk masks. While there are plenty of cute, spacey soft vinyl toys, Cosmad seems ready to fill the relative void of edgy cosmic vinyl. 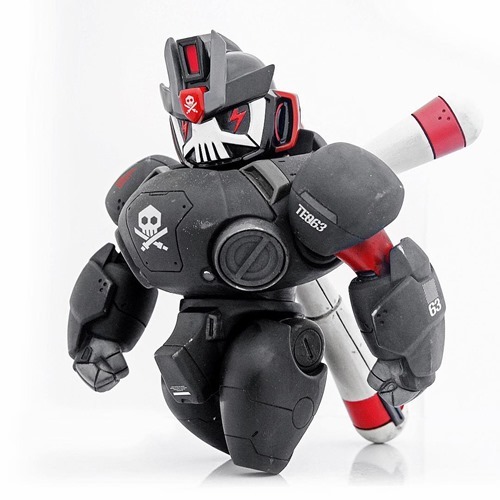 In addition to the upcoming Cosmad, Happiest Fung and his HappyFactory brand have created other figures including the semi-nostalgic Blojobot produced by Kaiju One. Fueled by darkness, Mora made its official debut at Kurobokan's show at Paradise Toys in Tapiei last weekend. Kurobokan released one piece of the violet+indigo debut figure (edition 5) at the show, while reserving four for the email lottery drop. Sculpted by Seriouslysillyk, Mora was first shown in proto form at TTF 2018 and then again in the debut colorway at the recent WonderFest 2019 Winter Edition in Japan. Mora is available now via lottery for $225. To enter drop a line to [email protected] with the "Lottery Submission for Mora" and be sure to include your full name, shipping address, Phone Number, and your Paypal ID. The deadline to enter is 8:59 PM PDT on Friday (3.15). 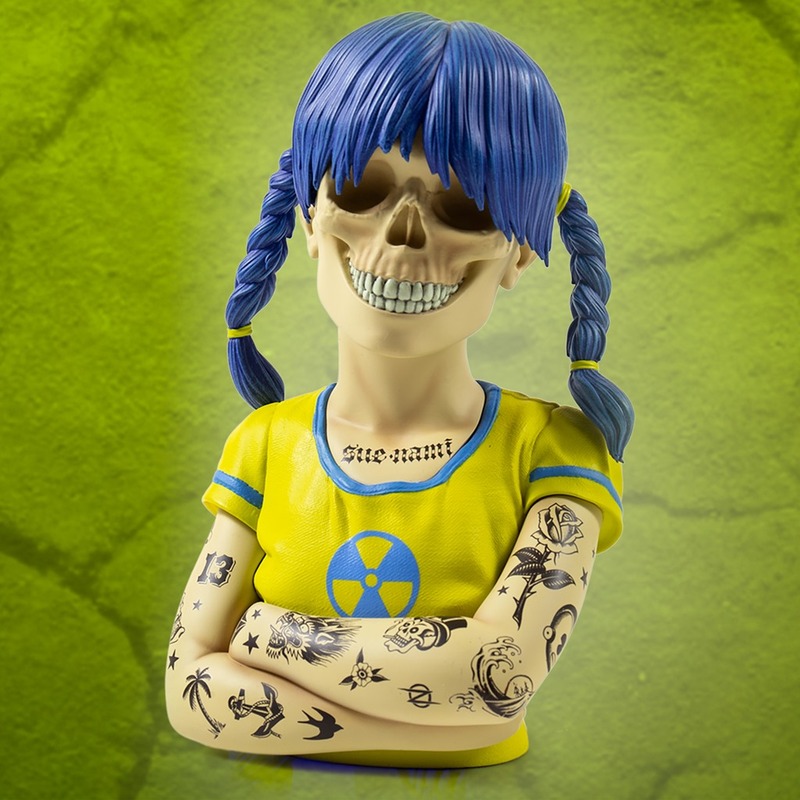 Kidrobot will release its exclusive Sue Nami resin bust edition (9") by Zoltron on Friday (3.15) at 9 AM PST on Kidrobot.com for $200. Limited to 50 pieces, this special version—inspired by Zoltron's wood-panel art piece exhibited in SF featuring extenstive tattoos—is a variation on the OG yellow+blue design which instantly vanished on it's Valentines Day release. The 9" polystone resin features metal reinforced braids, screen-printed felt base and weighs in at a hefty 4+ pounds. Since her debut gracing a DEVO concert poster in the wake of the Fukushima nuclear disaster, Sue Nami has inspired fans and collectors in various forms including the brand-new art busts. Jeff Lamm and Glyptigo are readying the debut edition of the brand-new Radical Greasebat. 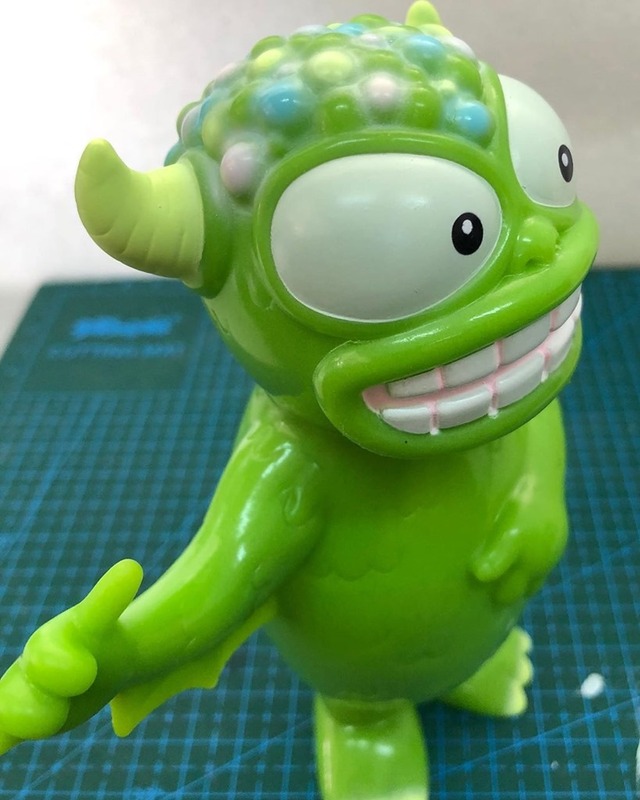 The new Radical sculpt features the artist's signature character in a chill mood rocking the shaka sign and was prototyped and brought to life by MonsterMind. From Lamm's recent postings, it looks like the first release should happen around late April via Glyptigo.com. We're excited about Greasebat's next chapter which starts with the new Radical Greasebat and is set to continue with additional characters including Gustav Tork, sculpted by Jeff's Wife, Debra Lamm. Mitari will offer four Mitari-chan figures sculpted by Kiyoka Ikeda of Gargamel via an overseas release—open to those outside of Japan—on Saturday (3.16) at 8 PM PDT from the Mitari online shop. The release will feature the regular size (5") Mitari-chan in black, the Obake Mitari-chan in black (open eyes) as well as chibi Mitari-chan figures in clear yellow and clear red. Mitari-chan charms will her elegant simplicity and subtlety.